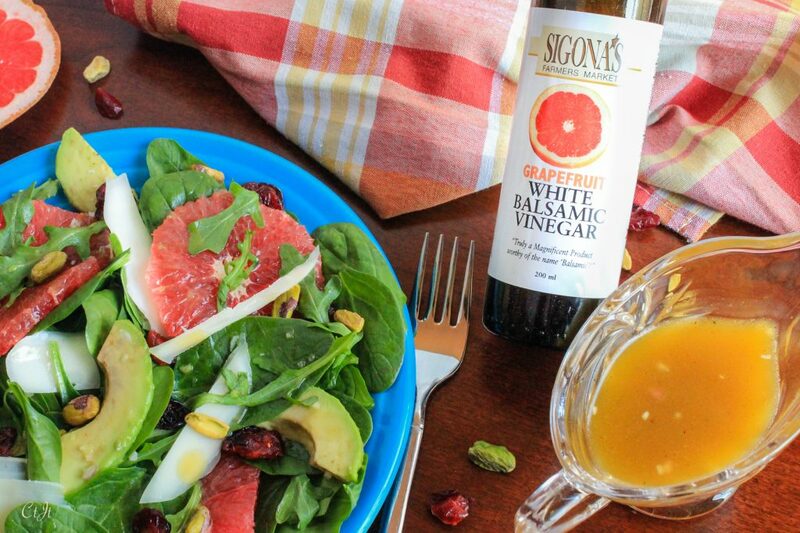 Our Grapefruit White Balsamic sparkles with crisp, clean citrus flavor. It has a perfect balance of acidity and natural sweetness. 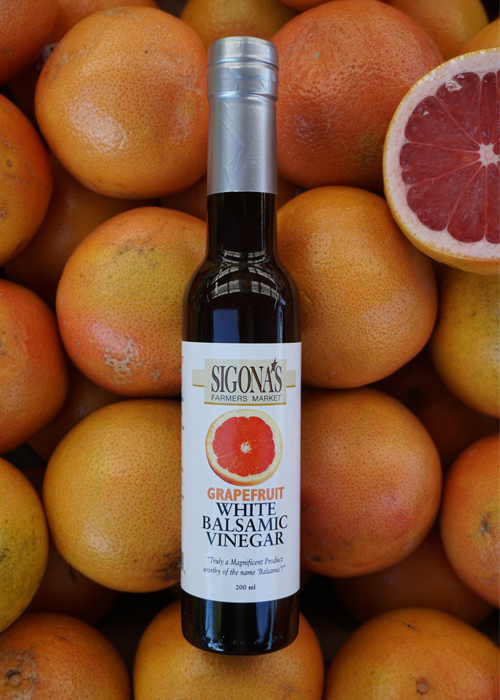 Try this amazing balsamic in dressings paired with fennel or get fancy and make a white balsamic grapefruit granita or sorbet. This is a cheerful salad for winter. The a tangy pink grapefruit awakens the palate while the dried cranberries and pistachios add more layers of flavor, interest and delight to the dish. Leave off the cheese if you wish. Adapted from The Olive Oil and Vinegar Lover’s Handbook. Serves 4. Directions: For the vinaigrette, whisk the balsamic, shallot, Dijon and honey together in a bowl. While whisking, drizzle in the olive oil, mixing until emulsified. Season to taste with salt and pepper. In a large serving dish or on individual salad plates, arrange the greens with a few slices of avocado and grapefruit supremes or slices in an attractive pile. Sprinkle with the pistachios and cranberries, then top with Parmigiano Reggiano shavings, if using. With a light hand, drizzle a little of the vinaigrette on the salad/s. Serve remaining vinaigrette on the side. *Supreming citrus: It takes time and patience, but is well worth the effort! To do this, cut the top and bottom off of your citrus fruit. Slice the peel from the fruit, top to bottom, getting as close to the flesh as possible. Once the peel is removed, slice any remaining pieces of white pith from the fruit so no white remains. Then, working over a bowl to catch the juices, slice closely along the sides of each membrane to neatly remove the citrus segments in between. And there you have it!